Sen. Corey Booker, D-N.J. talks to the press on Capitol Hill in Washington, D.C. in a file photo from Jan. 2017. Booker announced on Friday, Feb. 1, 2019, that he would run for the Democratic nomination for president in 2020. New Jersey Sen. Cory Booker is reintroducing the Marijuana Justice Act, which he first introduced in 2017. The legislation calls to decriminalize past marijuana-related crimes and make the drug legal on a federal level. The bill already has a number of co-sponsors who, like Booker, are hopefuls for the Democratic nomination for the 2020 election. Sens. Kamala Harris, Elizabeth Warren, Kirsten Gillibrand, Michael Bennet, and Bernie Sanders have all signed the legislation. Harris and Warren each opposed similar bills in the past, in 2010 and 2012, respectively, but have since each publicly advocated for the legalization of marijuana. Two other Democratic senators have not signed the bill, though each are eyeing a 2020 candidacy. Minnesota Sen. Amy Klobuchar, who is running, and Ohio Sen. Sherrod Brown, who is reportedly considering a bid, have not signed on. 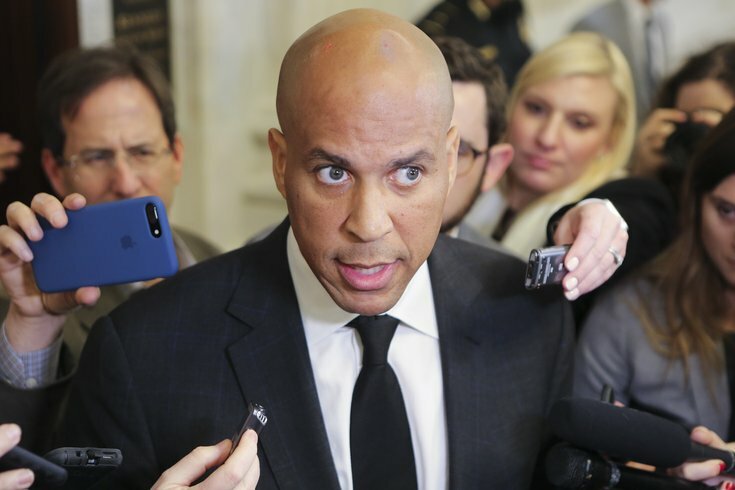 "The War on Drugs has not been a war on drugs, it's been a war on people, and disproportionately people of color and low-income individuals," Booker said in a statement introducing the act. "The Marijuana Justice Act seeks to reverse decades of this unfair, unjust, and failed policy by removing marijuana from the list of controlled substances and making it legal at the federal level." In addition to legalizing marijuana, the act would expunge the records of anyone charged with using or possessing marijuana. The act also promises to aid those individuals with resources for job re-entry and training. Booker's Justice Act is a major push in promoting equitable sentencing, and has been a cornerstone of his presidential campaign since he first announced his candidacy. The volume of presidential hopefuls signing on for the bill, as well, reflects a party growing more into the progressive sphere.